Last month, my friends at French Fridays with Dorie made waffles with cream. That week, I had a momentarily lapse of confusion and made the cheesecake tart which wasn’t scheduled until today. So this week while the Doristas enjoy their tarts, I will share my waffles with you. I grew up eating waffles at breakfast time. I’m not sure what the difference is between pancake and waffle batter, but my mother made them distinct by using Hungry Jack for pancakes and Bisquick for waffles. Waffles were a considered treat, I think because they are cooked one at a time, and when we had waffles, you didn’t have to wait for everyone, you just ate your waffle when it was hot off the iron. I even have memories of waffles for dinner occasionally, the same ones served at breakfast time but eaten at night. In France, waffles are not the entrée but dessert. These waffles were more delicate than the heartier ones I sometimes make for breakfast. (I use my college friend Sara’s recipe, not my mom’s.) I’m not sure whether this recipe is typically French, but the waffles were super buttery and light and crispy. The lightness came from beaten egg whites. I did have some trouble cooking these. I halved the recipe, and I didn’t do a great job of judging how much batter to pour onto the waffle iron. I ended up with three rather thin waffles instead of two. The instructions were a little confusing too. Dorie had us pour the batter and then spread it (straightforward), but unlike the savory waffles with smoked salmon we made last spring, she never says to close the waffle iron. She does tell us to flip them over. I tried both ways (with the waffle iron open and closed) and did flipped all of them, but they didn’t get quite as golden brown as they should have. I’ll attribute that to not using each batter for each waffle. The waffles being dessert, I sprinkled them with powdered sugar and drizzled them with chocolate sauce (some leftover chocolate ganache that I reheated). Neither of us care for whipped cream, so I had planned to serve ice cream with the waffles, but, uncharacteristically, there wasn’t any in the freezer. 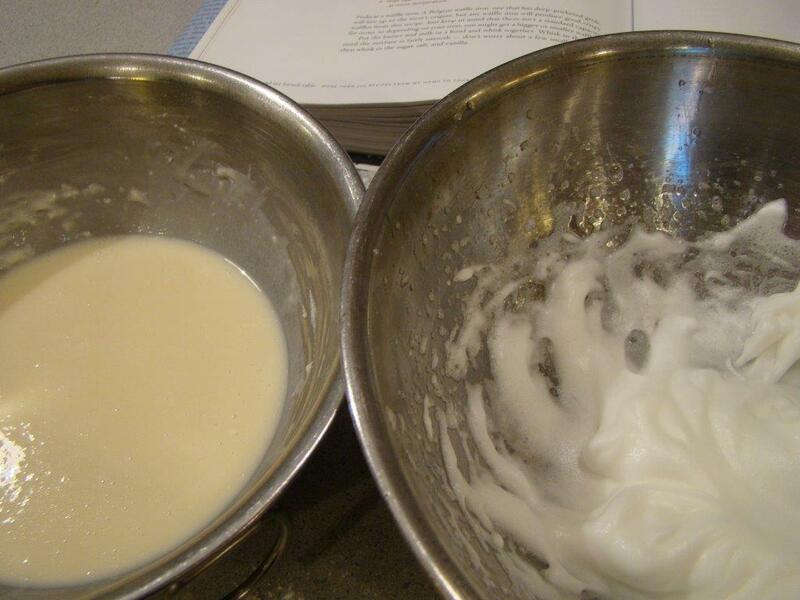 This wasn’t my favorite dessert recipe from AMFT, so I doubt I’ll be making them again. And for breakfast, Sara’s recipe is perfect so I’ll stick with hers. 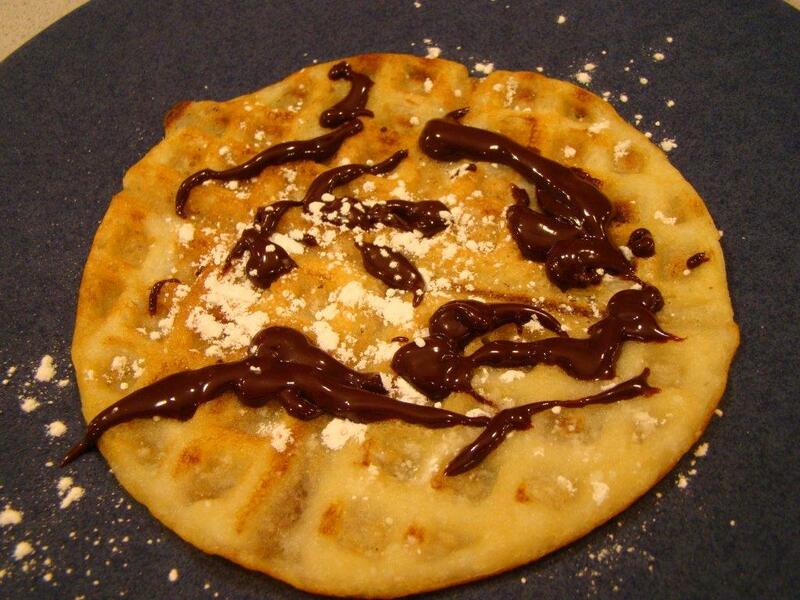 If you want to read more about the other Dorista’s waffles, check here. If you want to know about the cheesecake tarts they made this week, check here. The recipes can be found in Dorie Greenspan’s book Around My French Table. After our brutal winter, spring is decidedly here. Here are a few shots from my garden. Posted on 1 May 2015, in French Fridays with Dorie and tagged dessert, French Fridays with Dorie, waffles. Bookmark the permalink. 17 Comments. I haven’t made the waffles, Betsy. We love waffles but I don’t make them often. I’ve never tried them for dessert. Maybe I’ll get it done one of these days. Your flowers are beautiful! I don’t know anything more lovely than spring flowers!!! I loved the flavor of these waffles but I found all the butter made them really rich.. too rich. Of course my kids loved them, but I’d rather go back to breakfast style waffles. Oh Spring has finally arrived in the North-east! 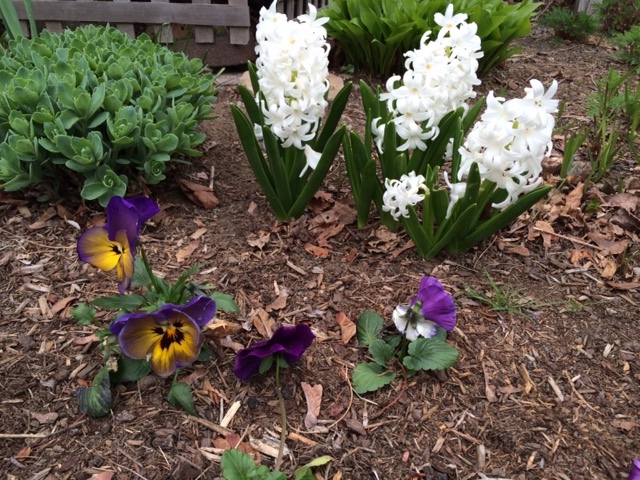 I also have beautiful flowers blooming…my favorite time of the year! I am wondering whether Dorie may have used a waffle pan…and not an iron. I used an iron that was quite large, and I could not get the batter to fill it completely. We did find them delicious! Yours look wonderful! Oh I love that you are seeing some of your favorite Spring flowers finally show up. Nothing here yet. I have been hearing hummingbirds so my birdfeeder went up yesterday. I love waffles, any way, shape or form so any kind works for me. Unfortunately I disposed of my 3 waffle makers (one, a Mickey Mouse form) when I moved. Bad idea. Betsy, waffles are such a treat sometimes but I agree with you, this was not one of the very best recipes in the book – there are better dessert recipes out there – for example the rather crowd-pleasing Cheesecake Tart! Now that was truly one of my favorites treats form Dorie´s book so far! Hooray – your flowers – such a wonderful springtime touch! Those flower photos are beautiful and I love those daffodils! I can see why they’re your favorites. For the dessert, yep, it’s not the best. I do like that it’s relatively easy to put together. Regardless, they look good! posting them later.This is probably the only thing I have finished in quite awhile. I just fed these to Bill for breakfast—easier than having to explain that these were dessert not breakfast waffles ;) Our coming week will be warm—I’m so, so ready for that!! Hope you’ve had a terrific weekend so far. Oh, I love your spring flowers! We stayed on Ile St.Louis, too! We loved it so much. You will love Licor 43 – its vanilla flavor makes it so delicious with fruit and in white Sangria! Bisquick! My Mom used it to make a sweet biscuit-topping for rhubarb and strawberries. I know it’s unsophisticated, but I still have a fondness for that treat. I really enjoyed the waffles, but didn’t bother flipping them. 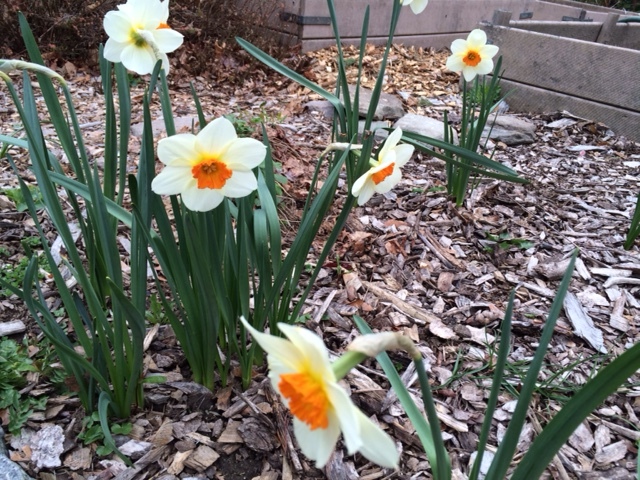 So glad you have spring flowers now, after the brutal winter you endured. Wow I don’t even remember the instructions for these – I just put the batter in the waffle iron and let it do its thing! Glad I didn’t read them, they sound confusing! LOVE your garden!! Your flowers are looking good. I wasn’t a fan of this waffle recipe either. Waffles are more of a dessert here too. Daffodils are probably one of my favorite flowers for the sole reason that they are the first ones up in spring. They just look so hopeful. As for your question about German desserts, I’m actually at a bit of a loss. The truth is that in my rather large cookbook collection, I only have one German cookbook and haven’t made any of the desserts from it. I’ll have to think about it a bit more and let you know if I remember any favorites. I am glad that you made it out of the deep freeze. We did not care for these waffles either. I grew up on bisquick for waffles at home but now we really enjoy the yeast waffles my husband makes. Now…my childhood waffle memories came out of a yellow box, but waffles were a treat nonetheless. Leave it to the French to served waffles for dessert. Too bad you didn’t have ice cream, because it made the dessert, in my opinion.